Bonds are an important part of many portfolios, particularly for those investors in mid to late states of economic life, or for endowments or pensions. Bonds are important for capital preservation and portfolio volatility moderation. In some cases, for experienced traders, they can also be a source of capital gains, but they are normally used for conservative purposes. One of the important risks with bonds is interest rate risk. If interest rates rise, the value of issued bonds declines. If interest rates fall, the value of issued bonds rises. The longer the time horizon to maturity of a bond, the more the value of a bond will change for any given change in interest rates. If the bond owner can hold the bond until maturity without needing to convert it to cash, capital loss due to interest rate change can be avoided. In the case of falling rates, the bond holder earns more than the “new money” rate. In the case of rising rates, the bond holder earns less than the “new money” rate. One solution some investors chose to minimize the interest rate risks associated with bonds is to construct a “bond ladder” in the bond allocation of their portfolio. A bond ladder consists of several different traunches of bonds with a range of maturities. For example, the investor might set up 5 or 10 traunches each 1 year apart in maturity. That way, 20% or 10% of the total bond allocation will mature each year and require reinvestment. 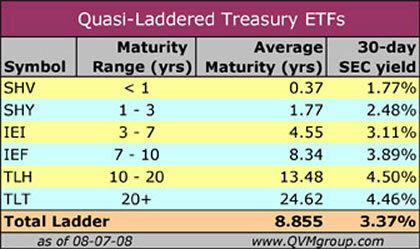 The table below shows how a 5-year ladder using individual AAA municipal bonds or individual Treasuries would look. As an aside, note that tax exempt AAA municipal bonds and Treasuries currently yield approximately at the same rate. This is an historical anomaly. “Almost a year after the Federal Reserve began to cut its target rate for overnight loans between banks to 2 percent from 5.25 percent, borrowing costs for states, cities, hospitals and municipal authorities are going in the opposite direction. Many investors find bonds more mysterious than stocks. That may be partly due to there being less information available over the internet about them. However, major discount broker-dealers have bond trading desks that are available to help investors make appropriate bond selections to build a bond ladder. There are enough features of corporate and municipal bonds that it is generally worth the cost of direct advice versus making online purchases of bonds, unless you are experienced. Except for Treasuries which are defined as having no theoretical credit risk, there is credit risk with corporate and municipal bonds. That means diversification of issuers is important. That in turn raises the question of minimum portfolio size required to build a ladder. If, for example, you wanted 4 issuers per traunch and if you had 4 traunches, you would need 20 bonds for your ladder. The larger your bite size, the lower the Bid/Ask spread for your transactions. You could build a 5 traunch Treasuries ladder with as little as $5,000 with direct purchase from the Treasury. You could build a muni or corporate ladder wtih as little as $100,000 or $200,000 if you used 20 bonds of $5,000 to $10,000 each. Best pricing would be for individual bonds of $100,000 or more each, requiring $2 million or more for the ladder. 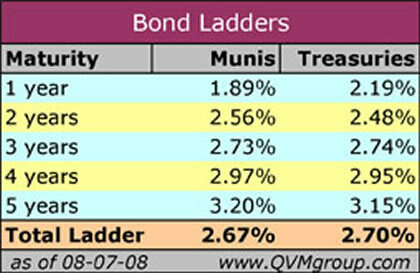 There is quasi-ladder approach (let's call it “layering”) that could be implemented with bond funds with various average maturities and a lot less money than $2 million. Bond funds have the advantage of taking large bite sizes which minimizes the drag on performance due to the Bid/Ask spread, but most funds negate that advantage to the investor due to management fees. The Bid/Ask spread is incurred only once, while the management fees is incurred each year during the life of the bond. Layering funds isn't quite the same thing as a ladder. You don't have the design control of a ladder. You can't create short intervals of 1 year of less. You can't control the mix of of maturities. You may not be able to control the credit quality. Nonetheless, there may be some appeal to layering maturities with funds. The table below shows an example of layering average maturities using equal Dollar amounts for each of several Barclays iShares Treasury bond ETFs. Note that not all of these named ETFs have enough current trading volume to be attractive as vehicles, but presumably that situation will improve with time. You might ask why not just buy the entire bond market in a total bond fund such as AGG or BND which track the US Lehman Aggregate Bond index. That index includes all US bonds with a maturity greater than 1 year, excluding municipal bonds. One reason is that the index has no short-term ( <1 yr) bonds. A more important reason is that it represents the distribution of maturities of all of the issuers in the US, which is not equally spread among maturity dates. The mix of maturities will fluctuate and will extend as far as the market extends. You have no control and may not want the particular mix and duration in the index. Also with a total bond market fund, you cannot select the credit quality you want. Instead you must accept the composite credit quality of the total market which changes as the mix of Treasury and other bonds changes, and as the credit quality of corporate and agency bonds changes. The dramatic change in credit quality of GSE's from Freddie Mac (FRE) and Fannie Mae (FNM) is a case in point. A bond ladder is significantly more work than buying bond funds, but provides the investor with the greatest control over maturities and credit qualities, and in some cases results in lower expenses. Expense control is always important, but is significantly more important with bonds than with equities. Bond ladders are not best for everyone, but it is perhaps useful to evaluate that alternative when planning a bond portfolio. Copyright 2006-2008 by QVM Group LLC All rights reserved.